Dave Kinsey has just just finished a new project with "No Fin, No Future" to help bring awareness to the overwhelming problem of shark finning. 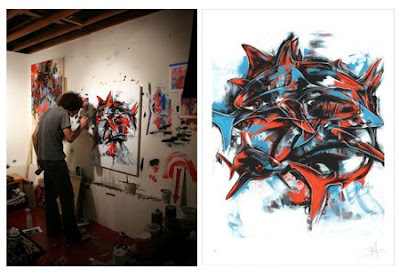 His new print, "Sustain" pictured above will be released later in the week, with proceeds to benefit Shark Saver, Sharkwater, and Shark Angels. The original canvas the print is based on is will be on display on the 29 August as part of the SEA NO EVIL ART SHOW,in LA. It's an art show benefit to raise awareness of the oceanic conservation needed through out the world. For the sole benefit of Sea Shepherd Conservation Society to continue their aggressive campaigns to end the illegal whaling in Antarctica, the bloody seal hunt in Canada, dolphin slaughter in Japan and illegal shark finning in the Galapagos. The show will feature over 60 art pieces from noted artists, including original art pieces from Anthony Lister, Shepard Fairey, Jeff Soto, Maya Hayuk, Deph and Dave Kinsey. The work will be sold in an silent auction format for the sole benefit of Sea Shepherd Conservation Society. We will keep you posted when we have more news on the release date of this great looking print. These are on a first come basis and will be shipped from Japan. Don't miss this chance to own such a special print. Your purchase will go to help save sharks and raise the awareness levels of shark conservation. Save our sharks, save our seas, save ourselves!